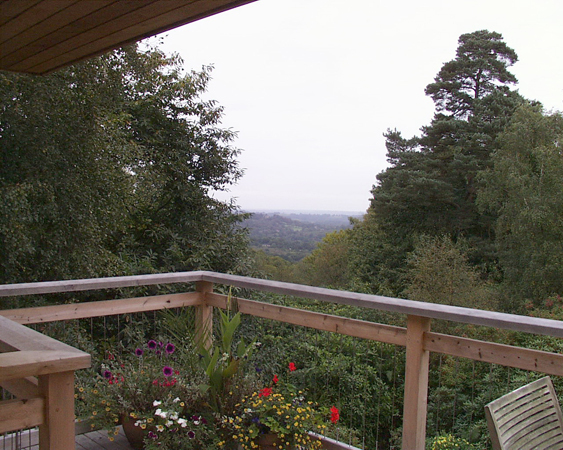 Nuthatch was originally a three bedroom dormer bungalow of some 160m2 , set on one of the highest ridges in the South of England, with views over twenty miles distant. 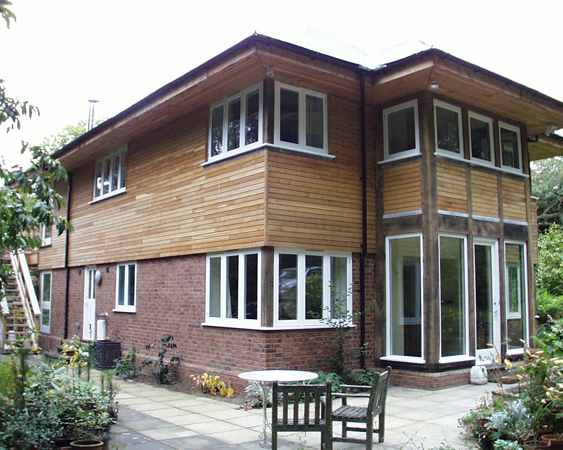 Located on the Surrey/Sussex border and set in over 3 hectares of very mature and highly attractive gardens and woodland, with prolific wildlife, the dwelling was both dark, suffering badly from shading and poor fenestration and with little or no aspect or view, in short a property with great unrealised potential. 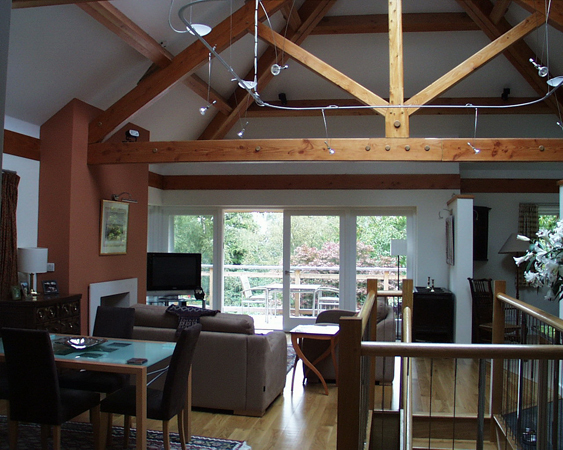 After considering remodelling and extending the existing house, the clients, a young professional couple, were persuaded to adopt a replacement dwelling as the solution and in so doing create a light and airy house that enjoyed the unique position and views available. The new 340m2 house reverses the traditional house form, with living accommodation on the first floor and bedrooms, together with the entrance, on the ground floor. The open plan living area, based around a top lit central staircase, enjoys uninterrupted views over miles of beautiful countryside. At this floor level from the main living space and from the master bedroom suite beneath, the rooms open onto timber decks at both levels, reinforcing the interface between the mature setting and the building. The accommodation comprises on the first floor living, dining and kitchen space, cloakroom and study bedroom, set around the stair well and four bedrooms and three bathrooms beneath. 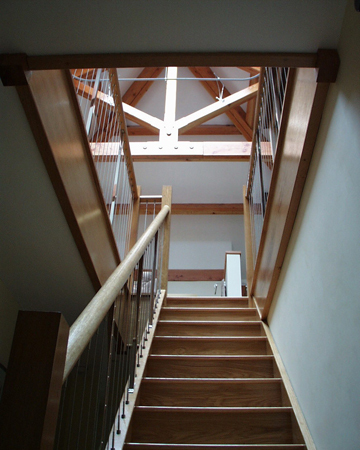 The very large lantern light over the staircase lights the centre of the deep plan, as being set within mature and dense woodland, natural daylight is at a premium. The building is constructed of a solid timer frame, clad at ground level with mixed stock facing brick and at first floor with flush, horizontal, planed and grooved oak boards, with matching hardwood windows, fascias and decks. 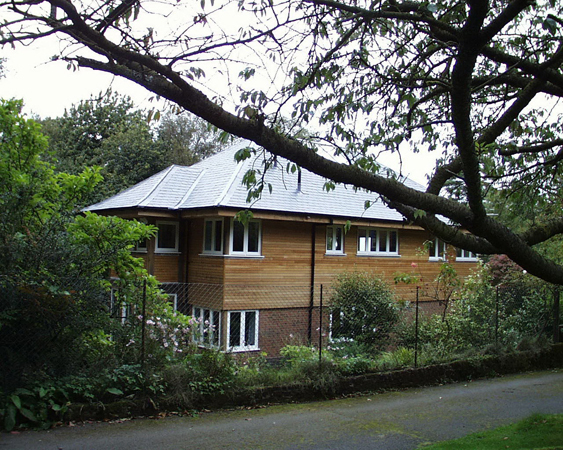 The simple but high quality timber cladding and hardwood joinery reflect and suit the woodland setting and sits naturally in the sloping site, providing the residents with spectacular views and with the decks, a very powerful interaction with the external landscape, the woodland environment and its rich flora and fauna. 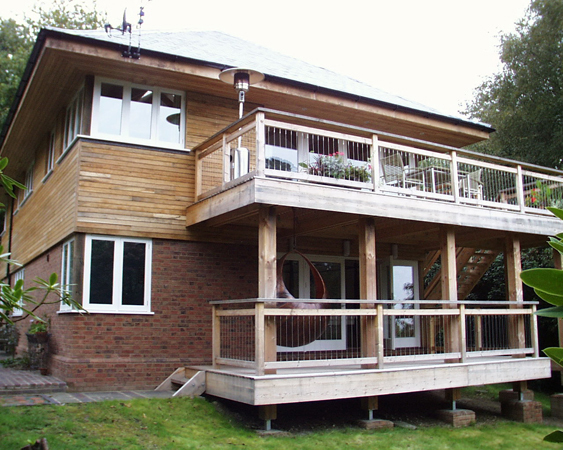 The main contractor on this project was KIngshotts Ltd.